Not too surprisingly, this graph shows a correlation between educators’ comfort with technology and their weekly use of technology. 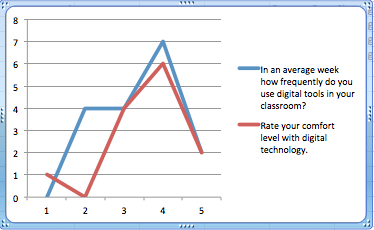 The higher the number on the x-axis, the more comfortable the educator is with technology. This past week I took an anonymous survey of teachers in Aniak, Elementary and High School, about the technology integration in their classrooms. As a district, we’re often pressed, fairly hard, to incorporate technology into the classrooms as a way to both engage and to prepare students for their next step in life. My survey, which is summarized in a short paper here, showed that the majority of educators are implementing technology in their classrooms, but are not completely comfortable with digital technology. Respondents overwhelmingly said that they preferred to learn about digital technology through peer-to-peer education/lessons. I think it’s very interesting that within Aniak we have a good number of digitally literate educators that still want to learn more. Even more interesting is that these educators prefer to learn from coworkers more than digital sources. My peers and I alike find value in the people surrounding us professionally more so than the digital community that we, as does everyone, have access to.